In his latest newsletter for The New York Times, Marc Stein takes a deep dive into the trade that sent Kristaps Porzingis from New York to Dallas, sharing several interesting new details on the negotiations leading up to the deal itself. The Knicks spent a good portion of January canvassing the NBA for possible Porzingis trades, according to Stein, who hears the team was rebuffed when it inquired on potential targets like Jazz guard Donovan Mitchell and Kings guard De’Aaron Fox. After devoting much of the month to possible trade scenarios, the Knicks were convinced that no team besides Dallas would take on the Tim Hardaway Jr. and Courtney Lee contracts while also offering a player like Dennis Smith Jr. along with multiple first-round picks, says Stein. New York’s management group has known for years that the Mavericks were very interested in Porzingis, with one Mavs official joking to Stein that Dallas had approached the Knicks “about a hundred times” before they finally showed a willingness to move the All-Star big man. Conversely, the Knicks had been expressing interest in Smith all season, per Stein. The Knicks and Mavericks had been discussing the framework of a possible Wesley Matthews/Hardaway deal for weeks, and began expanding those talks to include Porzingis on January 28, Stein writes. The two teams then worked in person toward finalizing the framework of a deal last Wednesday when the Mavs played the Knicks in New York. However, the Knicks wanted to wait until after they met with the Porzingis brothers on Thursday to make any decisions. Following that Thursday meeting between Knicks management and the Porzingis brothers, Janis Porzingis (Kristaps’ agent) provided the club with a four-team list of preferred destinations, a source tells Stein. The Nets and Clippers were on that list, but the Mavericks weren’t. The Knicks opted to move quickly on the Mavs deal in part due to concern that Porzingis’ camp would leak that list and threaten to only sign long-term with those clubs, Stein adds. The Knicks were informed that Porzingis was ready to leave the team and continue his injury rehab in Spain if he remained on the roster through the trade deadline, Stein hears. For what it’s worth, Stein reports that the threat of Kevin Durant leaving for the Knicks has “never felt more real” to the Warriors than it does now that New York has cleared two maximum-salary slots for the summer. Rival teams have inquired about Tim Hardaway Jr. and Courtney Lee, according to Mike Vorkunov of The Athletic, who suggests that the Knicks would be open to moving either player and creating additional 2019 cap flexibility — even if losing Hardaway would make the lottery-bound team even less competitive on a nightly basis. However, league sources tell Vorkunov that the Knicks “have been adamant” about not attaching any sweeteners to Hardaway or Lee in a deal. Both players are on pricey multiyear contracts and aren’t exactly positive assets right now, so any team willing to trade expiring salary for either Hardaway or Lee would likely be seeking a draft pick or a young player from New York. Apparently, as Vorkunov details, the Knicks are averse to that idea, as they were when they tried to shop Joakim Noah last year. In contrast to past management groups, the Knicks’ current front office has exhibited a commendable commitment to hanging onto future draft picks. And while that stance may be in the club’s best long-term interests, it may reduce the likelihood of Hardaway or Lee being dealt by February 7. Perhaps, as Vorkunov writes, a contending team in need of a veteran scorer or shooter will relent by the deadline and make a deal with the Knicks without asking for an extra asset, but that’s certainly no lock. Vorkunov’s piece goes more in-depth on which Knicks players are the most and least likely to be moved by next month’s deadline, and is worth checking out in full. He identifies Enes Kanter as the player most likely to be with a new team after February 7, though a number of other veterans are also trade candidates. Speaking of Kanter, he expressed some disappointment and frustration on Monday after being informed by head coach David Fizdale that he’d likely be out of the rotation going forward, per Marc Berman of The New York Post. Of course, Kanter’s removal from the rotation lasted about a quarter and a half — he entered Monday’s game in the second quarter after Luke Kornet went down with an ankle sprain, and figures to continue seeing regular minutes if Kornet has to miss time. The Knicks’ commitment to a youth movement may not be good news for Kanter, but it should benefit Frank Ntilikina, writes George Willis of The New York Post. 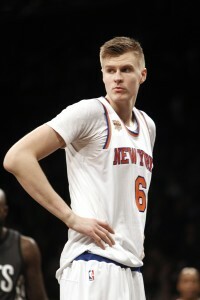 The Knicks have treated the re-signing of Kristaps Porzingis as inevitable, given his pending restricted free agency, but the idea that Porzingis will have no leverage in the process is “bogus,” according to Stefan Bondy of The New York Daily News, who points out that star players can “maneuver themselves out of undesirable situations” even when they’re under contract. Even if Porzingis doesn’t go the extreme route – accepting his one-year qualifying offer and becoming an unrestricted free agent in 2020 – he could make things difficult on the Knicks by demanding a shorter-term deal (three years with a fourth-year player option) or signing an offer sheet with another club. In that scenario, the Nets would be a team to watch, per Bondy, who writes that GM Sean Marks is high on Porzingis and has a history of pursuing RFAs. A five-year, maximum-salary deal with the Knicks would allow Porzingis to maximize his earnings and would give him long-term security. However, some people around the NBA believe the Knicks may try to include injury protection language in their offer, says Bondy. That way, if Porzingis has recurring issues related to his ACL recovery, the team would be protected to some extent. The youngster views himself as a max player though, according to Bondy, so New York could risk creating discord by offering less than that. In a separate Newsday story, Popper explores how Emmanuel Mudiay‘s confidence has increased since he was dealt from Denver to New York last year. Within a story about Courtney Lee, Marc Berman of The New York Post provides a tidbit related to the 2018 draft, citing sources who say the Knicks passed on Michael Porter Jr. last June in part because they were told he wouldn’t play in 2018/19. However, Berman now hears there’s still a chance Porter will make his NBA debut for the Nuggets later this season. It wasn’t easy for Knicks coach David Fizdale to part with Ron Baker, writes Marc Berman of The New York Post. Baker was waived yesterday to open a roster spot so that Allonzo Trier‘s two-way contract could be converted to a standard NBA deal. Baker spent more than two seasons in New York after making the team as an undrafted free agent in 2016. When Steve Mills took over as Knicks president last year, his first move was to use the room exception to give Baker a two-year, $9MM deal, but despite the team’s confidence Baker never developed into a consistent rotation player. He was averaging just 1.3 points and 9.7 minutes in 11 games this season. Courtney Lee is back after one game in the G League and might see an increase in playing time while Damyean Dotson deals with a sore shoulder, Berman adds. The Knicks would like to boost Lee’s trade value and unload his $12.76MM salary for next season. The new deal with Trier may have at least slightly improved the Knicks’ prospects to land Kevin Durant, Berman notes in another piece. Durant became somewhat of a mentor to Trier when he was in high school in Oklahoma City and they have remained friends. Trier’s two-year contract is non-guaranteed for next season — and it could take away valuable cap space New York will need to make a full max offer — but Berman states that the front office intends to keep Trier as long as he continues to perform at his current level.